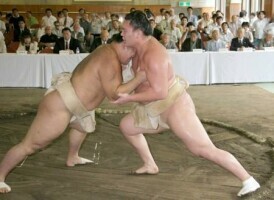 The usual soken that precedes each Tokyo-held basho took place on August 31st, at the Kokugikan's training institute. Obviously, attention was foremost on Hakuho. The young Mongolian was getting ready for his first tournament as "the sole yokozuna". He fought sixteen consecutive bouts against the four ozeki, trying out various moves. He finished with a 10-6 score: "I didn't fight many bouts, but they were intense. My body moves well." The other rikishi drawing attention was Kotomitsuki, who was facing his first tournament as an ozeki. And after the recent passing of his master Kotozakura, he was also additionally motivated and determined not to play second fiddle. The ozeki fought eleven bouts and won seven of them. He faced colleagues of the same rank and the yokozuna. Against the yokozuna, he finished with an even score: two wins and two losses. Hakuho won the first bout by hatakikomi and the third by a very technical migishitatenage. He was visibly impressed by the Sadogatake wrestler's performance: "Kotomitsuki is in shape, isn't he?!" Kotomitsuki won the other two bouts, one of them with a beautiful dashinage. For a moment he seemed serene: "If I feel under pressure here, it's over for the tournament. I am in good physical condition, and I will be careful not to get injured before the start of the tournament." Kitanoumi rijicho was also pleased: "Kotomitsuki has advanced to a much higher level than when he was a sekiwake." If the two most watched men did not disappoint, this was not the case with the other three ozeki, Kaio (who is recovering from an injury), Chiyotaikai, and Kotooshu, who were content with a half-hearted soken.